Reaffirming its position as one of the UK’s specialists for the Porsche 911 Carrera RS 2.7, Autofarm has sold a two owners from new RS that it has tended for the past 31 years. Strong demand for the car and Autofarm’s extensive network contacts meant the car sold for over £500,000 before the Porsche specialist had the opportunity to market it publicly. Carefully stored and not used on the road for the last 24 years and having just been prepared by Autofarm’s Mike Evans, who has worked on the specific model for the past 38 years, chassis 0899 provides the chance to experience an RS just as it would have been in 1973. Originally supplied new to an Italian customer, the left hand drive M472 specification car was driven to the UK in 1983 by its second owner. Used until 1990, then put into storage, it underwent a renovation and engine/gearbox refresh by Autofarm in 2002, returning to its dehumidified chamber last year. The engine has just had its first service since the rebuild, underlining the ‘as-new’ driving experience. 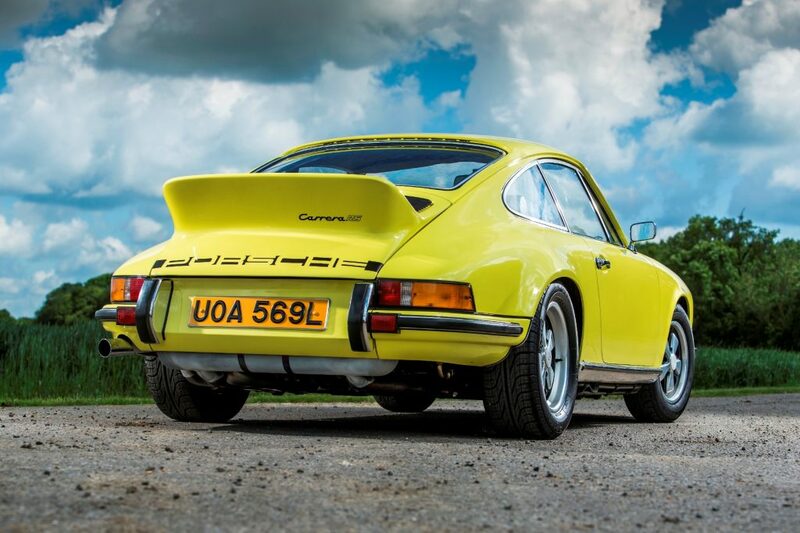 Chassis 0899 is the latest Carrera RS 2.7 Autofarm has been able to offer for sale. Recent examples include the former Porsche Club Championship winning and Circuit of Ireland RS, a Touring specification RS owned by an eminent High Court judge and maintained by Autofarm for 32 years. Autofarm has confirmed that a further Carrera RS 2.7 is to be offered for sale later this year. The RS, a pure homologation special, was originally intended to be a run of 500 cars but demand ultimately led to 1590 being produced by Porsche. Typically lighter than the 911S and sporting a ducktail spoiler and fibreglass splitter, it offered 210bhp from its 2687cc engine, delivering 0-60 in around 5.5 seconds. An original factory specification, Chassis 0899, from the Second Series, was built for the Italian market as a simple base specification Touring with no options. It still has all its original major components including its Fuchs rims with just the addition of a limited slip differential and period pattern door mirrors being the only upgrades fitted in the 79,000 miles it has done. Based in Weston on the Green, Oxon, Autofarm www.autofarm.co.uk is a leading independent Porsche specialist. Founded by Josh Sadler, Autofarm has 40 years’ experience of maintaining, preparing, racing, restoring and selling Porsches of all ages. The Oxfordshire based workshop offers servicing using accredited diagnostics equipment, sales, parts, race preparation, restoration and engine rebuild capability. Its extensive road, race and rally engine experience led the company to develop Silsleeve, an innovative and cost effective method of repairing damaged modern Porsche cylinder blocks. Autofarm enjoys close links with Porsche and the leading Porsche owners’ clubs. 2013 marked Autofarm’s 40th anniversary.